A rooftop ceremony held at sunset with the historic Ferry Building Clock Tower in the background to mark the exact minute you say I do... This is an amazing way to begin your new life together, and one that only Hotel Vitale can offer! Your friends and family will enjoy the exquisite service that only a true boutique hotel can offer. 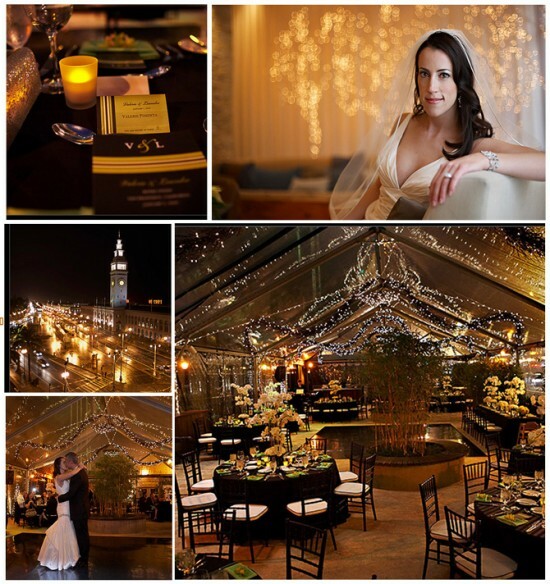 The impressive views, tranquil atmosphere, and twinkling stars and city lights of a San Francisco night will have them smiling long after the party is over. This gorgeous wedding was photographed by the incredible Geoff White and epitomizes the amazing rooftop wedding you can host at this historic San Francisco wedding venue. I love Hotel Vitale because it has the only rooftop location in San Francisco where you can dance under the stars and still stay cozy and warm. If you'd like to see more of this gorgeous location, check it out on the I Do Venues blog!